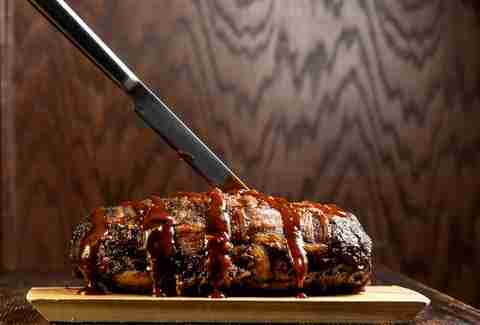 Yeah, yeah, everyone loves bacon. 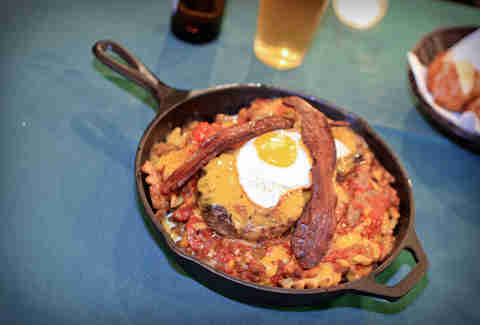 But this is a whole different level: Paddy Long’s Bacon Bomb is a 5lb loaf of ground sausage, pork, and beef that surrounds a pepper-bacon center and has a sugar-bacon-weave exterior, all served with a huge side of fries. 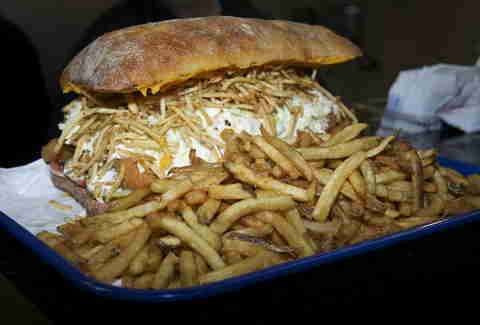 The Po’Boy Challenge at Fatso’s Last Stand features an absurd seven-pound sandwich that’s made with 2lbs of fried jumbo shrimp, coleslaw, pickles, lettuce, tomatoes, special sauce, cheddar cheese sauce, and shoestring fries. You’ll have to finish off a pound of fries and a 32oz soda as well. 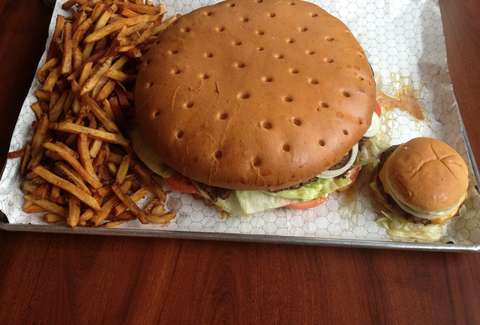 If you’re not feeling up to the po’boy just yet, there’s also a Jumbo Fatso challenge that consists of a 5lb burger with a half pound of fries (that's it pictured above). When an eating challenge has “911” in its name, you know it will definitely kill you... oh, uh, or like, um, be lots of fun? Or something? 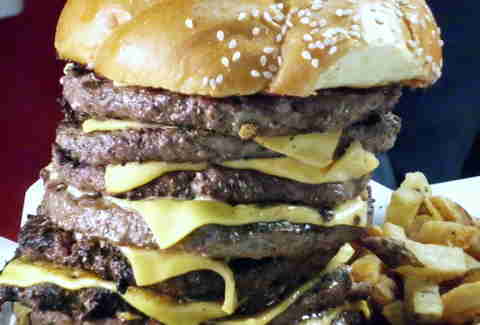 Either way, this towering creation features 3lbs of beef, nine patties, and eleven slices of cheese. 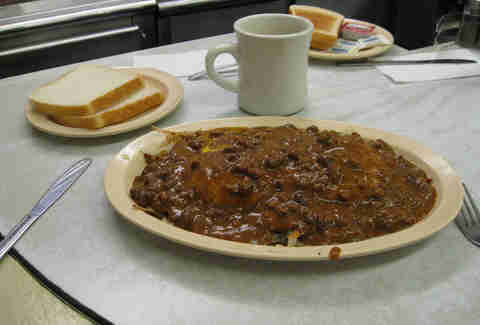 The Slinger at Diner Grill isn’t really much of challenge to finish (it's a car-wreck of hash browns, eggs, chili, onions, cheese, and hamburger patties), but look at the picture of it above and tell us you don't think that would be hard to eat? Yup. For those who like a little bit of variety with their gastrointestinal complications, the Ultimate Eating Challenge at The Fifty/50 offers a variety of eats in one epic challenge. The whole shebang includes (take a deep breath) 30 Buffalo wings, five bacon strips, five onion rings, one side of mac & cheese, a half rack of ribs, one burger slider, one turkey burger slider, one pulled pork slider, one duck breast slider, one grilled cheese slider, one crab cake slider, one PB&J slider, and 50oz of beer (exhale). 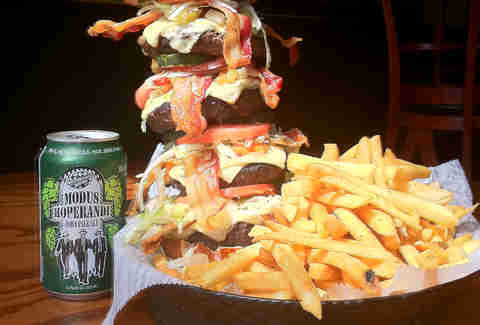 Popularized by Man v. Food, this eating challenge offers the opportunity to live out an episode of You v. Man v. Food. 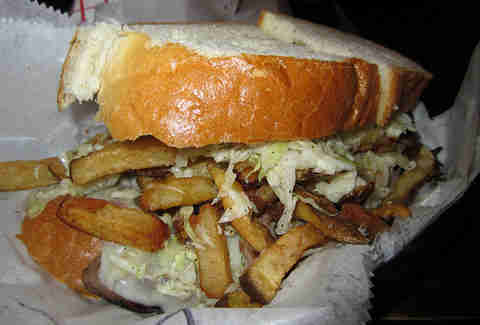 Simply choose three of the qualifying sandwiches -- all of which are stuffed with fries. The Rockstar Burger at Rocks Lakeview looks more like the Leaning Tower of Pisa, if the Leaning Tower of Pisa were made of cheeseburger. It features four Angus beef patties topped with eight slices of bacon, giardiniera, cheese, onion strings, lettuce, and pickles, all on a pretzel bun served with a pound of fries. The whole meal weighs 4lbs. The fact that this challenge is actually doable for mere mortals also makes it great for, you know, actually enjoying your meal. 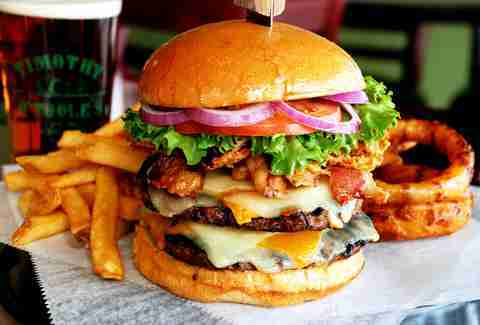 This tasty-looking burger comes with two half-pound patties topped with cheddar, mozzarella, jack, Swiss, onion straws, bacon, barbecue sauce, lettuce, tomato, onions, and fries. The cooks here do not mess around. Challengers will have to sign a waiver before proceeding, and the wings are made with the Trinidad Scorpion pepper... which sounds really freaking hot because, again, it’s called the TRINIDAD SCORPION PEPPER, in case you missed that. Finish the order without ringing the bell for a "cooling plate," and you’ll get your photo on the Wall of Flame. 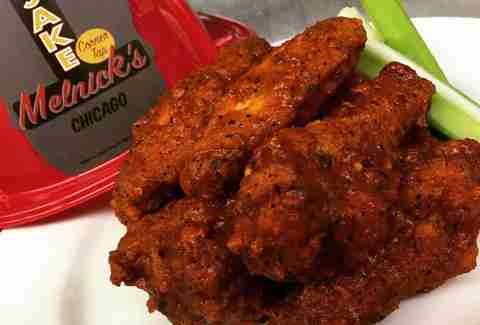 Sign up here for our daily Chicago email and be the first to get all the food/drink/fun in town. Raf is a long-tenured Baratheon loyalist and Point Break apologist. You can check out his weird-smelling blog Alley Connoisseur, and follow him at @RafFoSho.